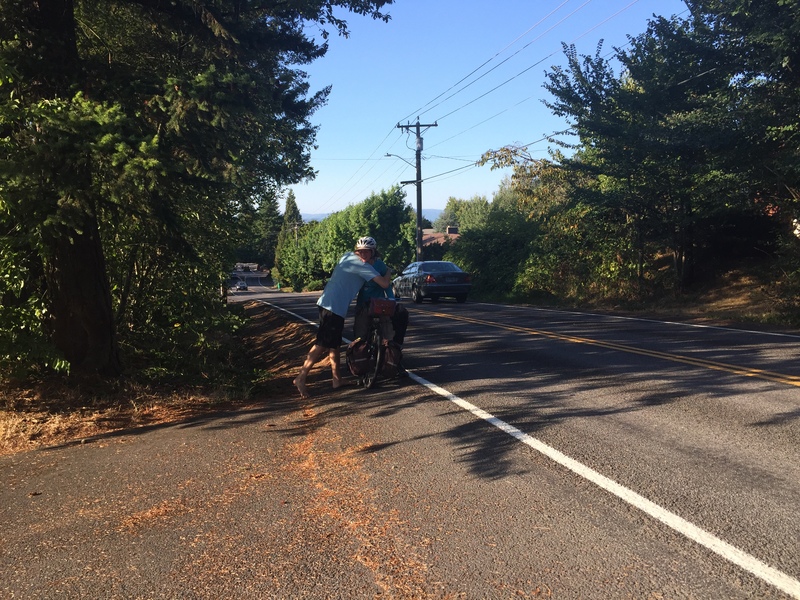 I left on a Sunday, to meet Zach and Kim Wednesday evening in Gresham, so had four days to do a ride that many people I met told me takes two days. I was happy to spread it out a bit, though, to explore a little, and hide from the heat a lot. I started east and rode around Mercer Island, stopping at the farmers market and swimming in the lake, before crossing to the east and heading south along Lake Washington. The towns were pretty densely spaced, but I did get some lovely views of Mt. 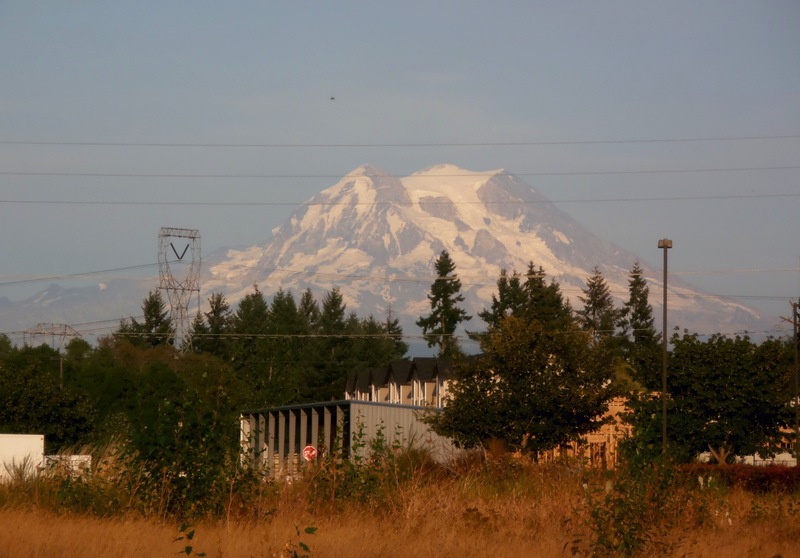 Rainier as I rode through them. 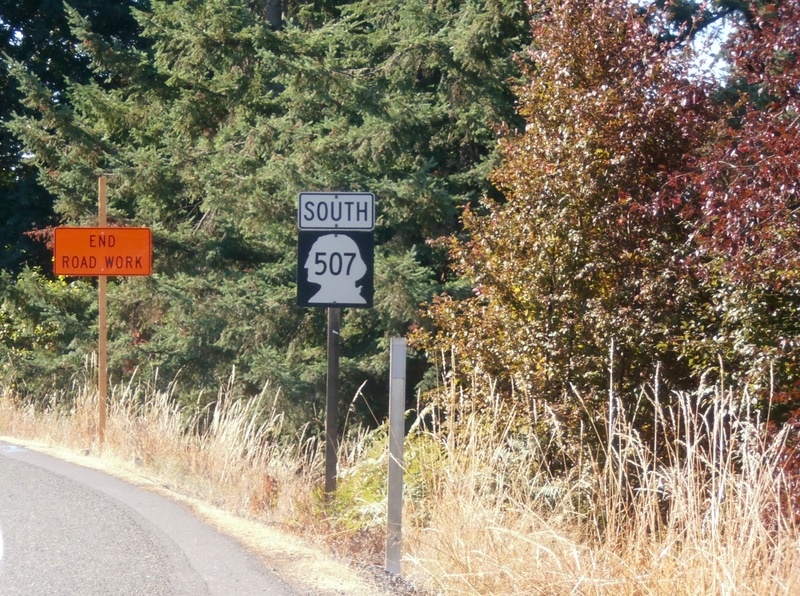 You know how every state uses a different shape on their state route signs, this is Washington’s, which made me laugh. Also I like to imagine the “End Road Work” signs are protesting road work. I found many plums and blackberries along the way, which has kept me in sugars. I’m sure I’ve eaten more plums in the past few weeks than in all the rest of my life together, in volume and variety. The day I got into Oregon was so hot. I stopped in Scappoose to eat around 10:30, and it was almost 90F already. I sat in a gazebo behind the library with a book and my snack and was soon joined by young kids and their mothers. The children ran and screamed and knocked each other down and cried. When I packed up one of the mothers commented that she hoped they weren’t chasing me away, they were loud, weren’t they, and I was there first… but it was just a good reminder to get going, not stop too long when the day was only getting hotter. I was riding along the river, but it seemed too industrial to warrant getting in it, and all the streams I passed were dried up. I didn’t try very hard, really, to find a swimming spot. When I got into Portland I hung out in a library for a little bit, wandered a little, stopped at a farmers market where I felt almost too delirious to pick anything (but I managed) and talked to some lovely people. It has been so exciting to spend a few days with my brother and Kim and Michaela! It is nice to see where Kim grew up and see a bit of this part of Oregon, which is beautiful (especially before the forest fire smoke started blowing in). It also feels a bit like a break, like being at home. We’ve hiked and explored and eaten many things. We visited the Columbia River Gorge and Portland, many parks and the Saturday Market, Rooster Rock for swimming (naked) and jammed with the Michaela’s collection of instruments. Mostly we’ve had a lovely bunch of time to visit with each other. Today we’re all going our separate ways. This computer of mine works only sometimes, and hence, I am just catching up on reading. Thank you all, for meeting here. The laughter and giggles poured from Kim’s room, and I slept knowing I would wake to more. You made a difference, I saw life in ways I had not before.